Alright! Happy April 5th! 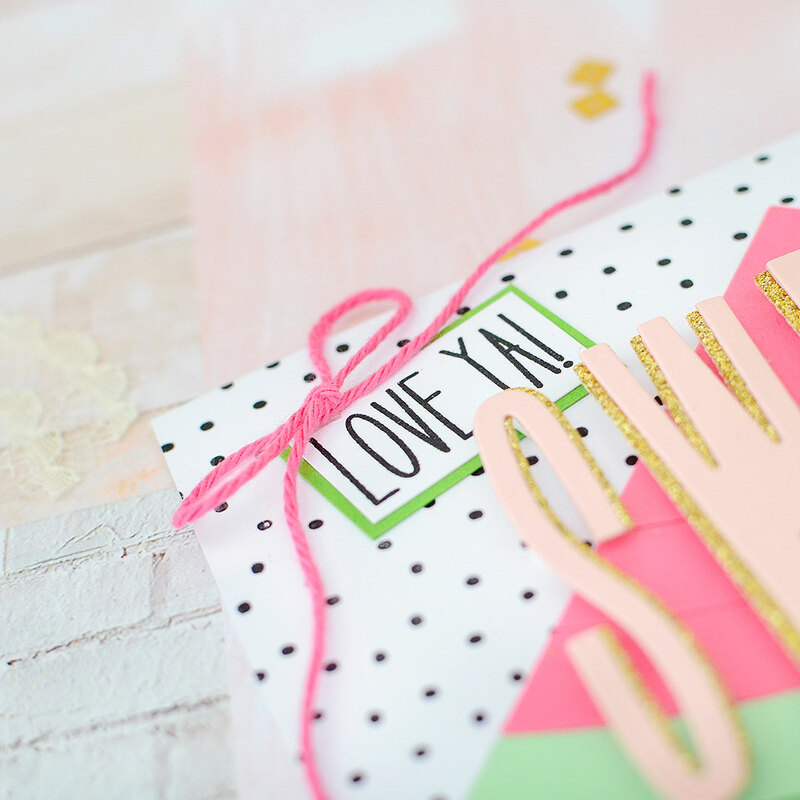 Have you checked out all the new amazingness from The Stamp Market?! 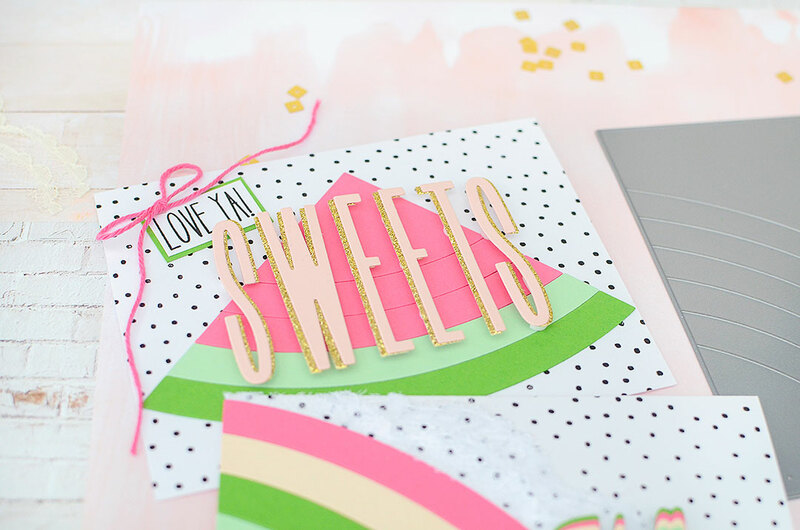 It's all available in their shop today, so after you've made the blog hop rounds, be sure to pop over to the store and get first dibs on everything! 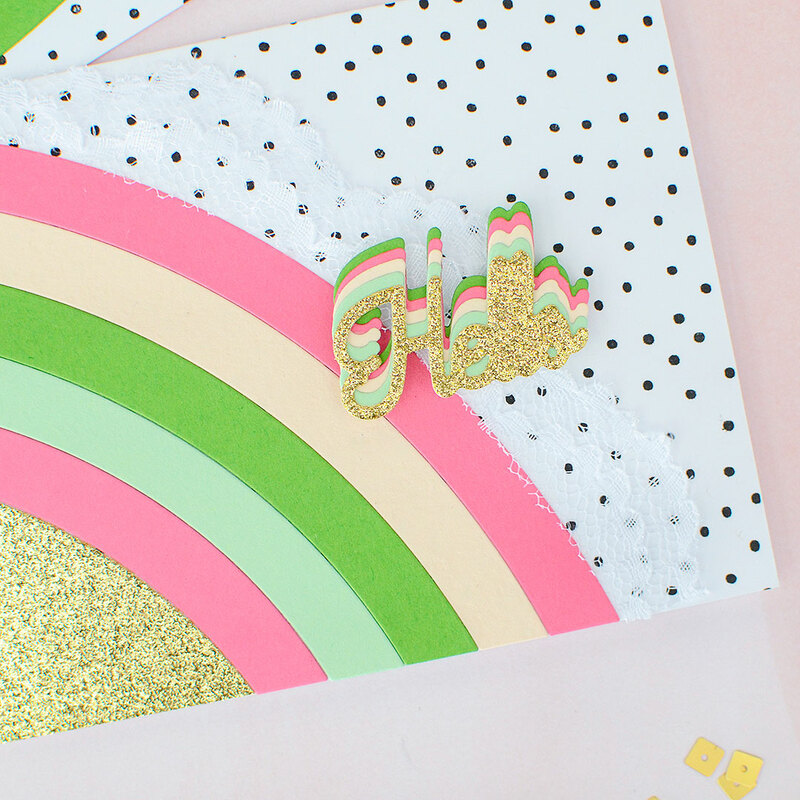 I'm pretty over the moon for the Rainbow Card Cover die, and I KNOW I won't be the only one. I'm also in love with that All In Bloom stamp and the Skinny Upper Alphabet and...well, OK, I love it all. I've got 2 cards to share today and I focused on the Rainbow, pairing it up with some of the other fun release items. On both cards, I used a the Confetti Background from the February release. I know it's not new for April, but you can probably guess why I wanted to use it (um, watermelon seeds anyone?) and hey, you can also tell that these products work great together, no matter when they are released! 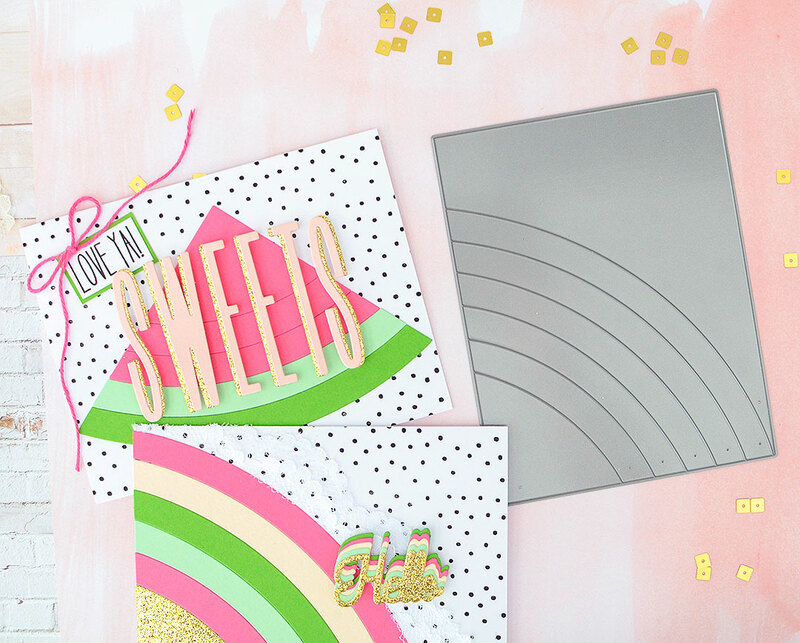 I actually began with the Hello card first, using the rainbow die the way it was intended--as a rainbow. By happenstance, I chose pinks and greens, first adding in a couple of other colors, but ultimately deciding against them. 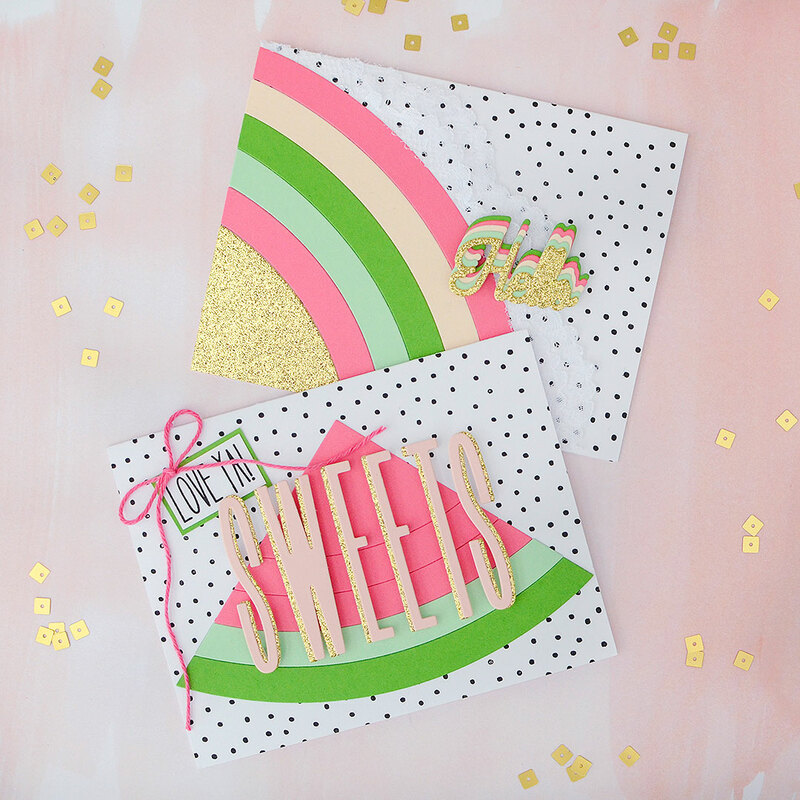 I did throw in the gold glitter card stock at the end, and loved it--it's like the pot of gold at the end of the rainbow! 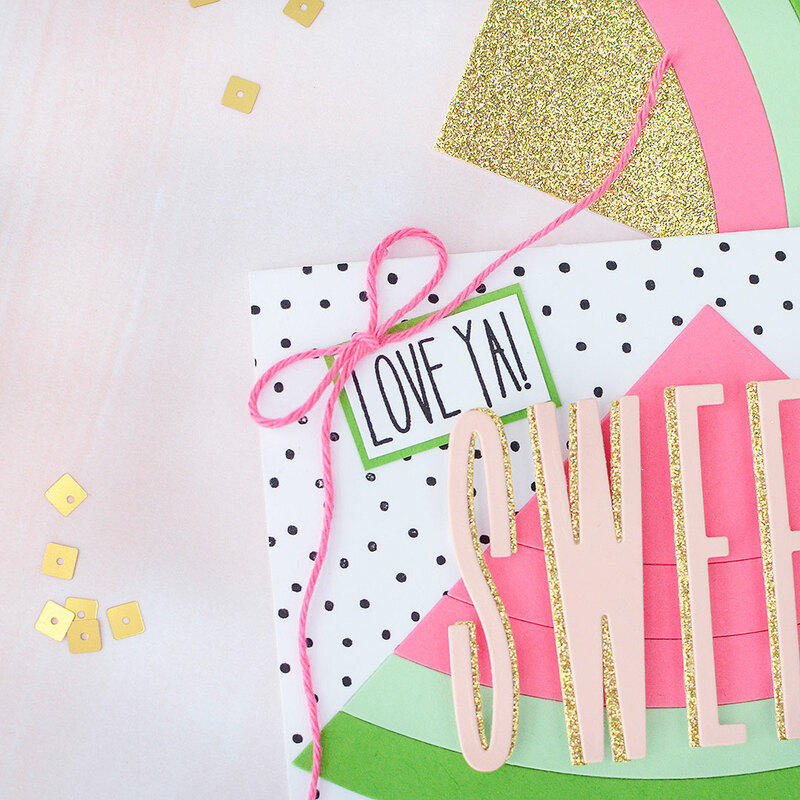 After playing around with the extra cut outs from each pink and green paper, I realized they looked very much like a slice of watermelon when turned upside down. And then I was even more smitten with this die! I love when you can use stamps and dies for things other than for what they are intended, don't you? 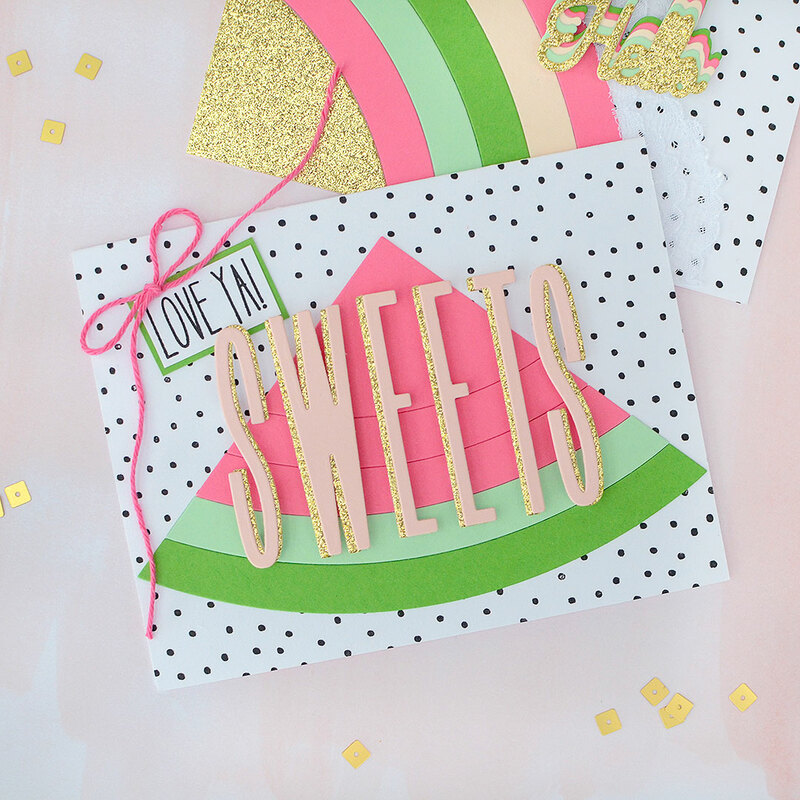 I stamped the Confetti Background in black ink, laid out my watermelon slice, and then cut out S-W-E-E-T-S in pink and gold glitter card stocks from the Skinny Upper Alphabet dies, layering them in an offset way, which I love to do for dimension. I adhered the letters overtop the watermelon with tiny 3D foam dots that I cut in half in order for them to fit behind the skinny letters. The card still needed a little something more, so I stamped 'Love ya!' from All In Bloom, matted it with green paper, and added a little pink twine bow. I love this card so much! 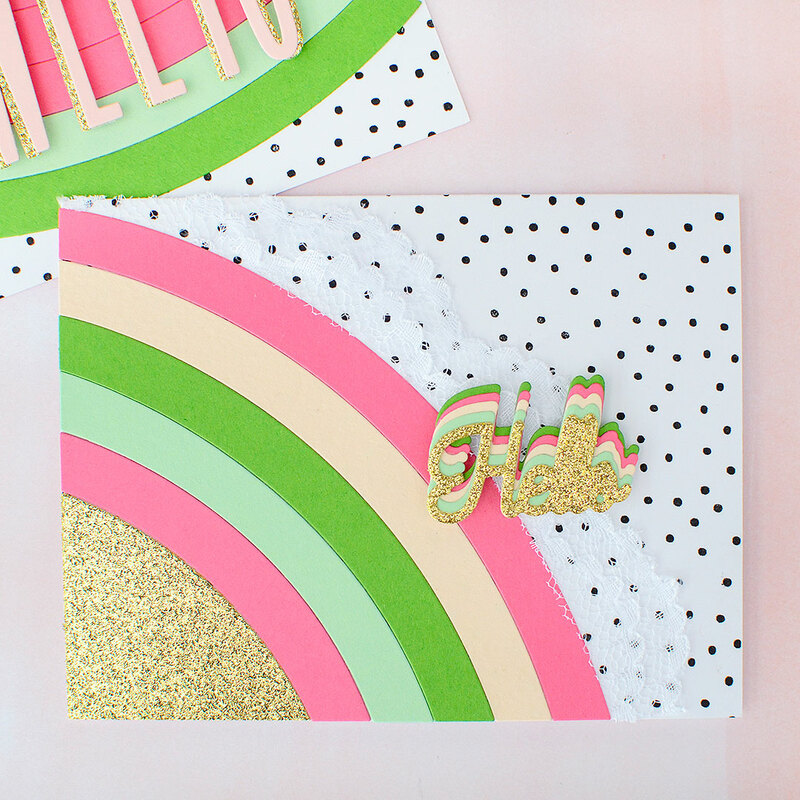 Back to the 'Hello' card, I stamped the Confetti Background in black again and assembled my pink, green, and gold rainbow. 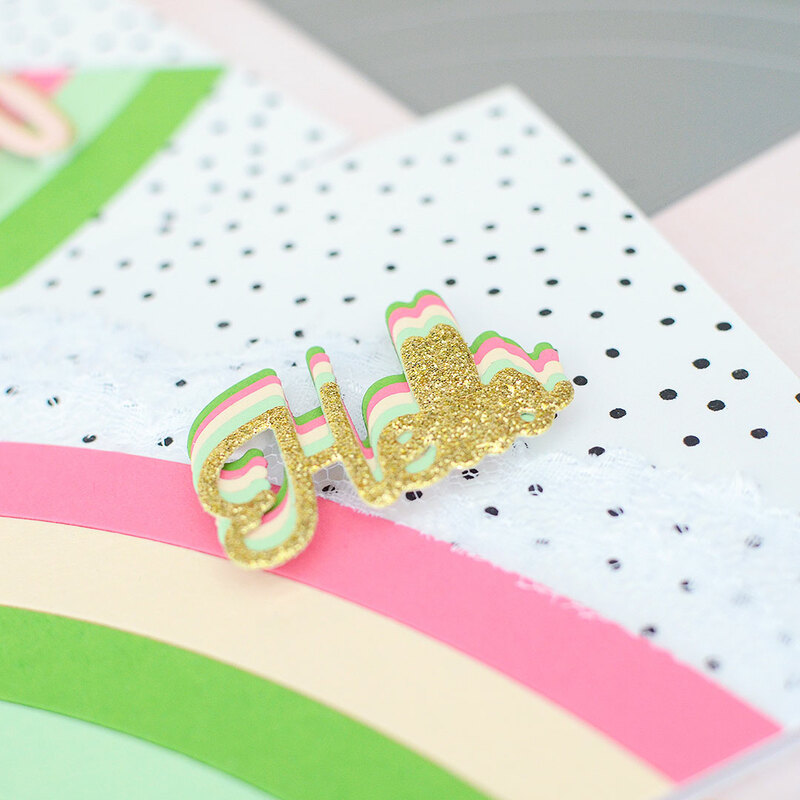 I die cut 'Hello' (found in the Have A Nice Day die set) from all the matching colors of card stock and layered them together which gave it kind of a retro vibe. Once more, I felt it needed just a little something extra, so I took the end of a cut of white lace with a scalloped edge and styled it around the last curve of my rainbow. It's a little textural appeal, and the scallops mimic the rainbow line. All that was left to do was add the group of 'Hello' die cuts, attached with 3D foam. That will do it for me today, but I'll be checking back in each week this month with a new April project. Please be sure to visit each blog on our hop and then head to the TSM shop to choose which goodies you're going to scoop up! Fabulous cards! Love the rainbow and watermelon! Great colors! How absolutely fabulous! Your rainbow transformed into watermelon is awesome! LOVE! Concord and 9th :: April Guest :: Piñata Party! Concord and 9th April Guest :: Fringe Frenzy!